UCSB ready and waiting Matt BrownAlex Harris made a meteoric rise from his sophomore to junior seasons. What's in store for his final season? Bob Williams has a team of basketball players that might as well be stuck on some remote island with no food, no television, no books, no means of outside communication, no companion named Wilson. They're absolutely certain it's their time to devour eight other Big West Conference teams. "We think we have the makings of a good team," Williams said. "We've added more pieces, and we're as healthy as we have been in some time. We think the maturity of this group will help a great deal in getting us over the hurdle." Five teams are potentially good enough to win a Big West title this season, yet it's the school located on the California cliffs directly above the Pacific Ocean -- the school with its own beach, mind you -- that might own the best opportunity. It's a team that returns four starters from a squad that finished three games out of first place last season. For the fifth time in six seasons, UCSB was above .500. Its 18 wins tied for the second-highest total during the nine years Williams has coached the team. But UCSB also spent March at home watching NCAA and NIT games. They're hoping for more to show from all those winning records. It's a harsh reality of mid-major leagues like the Big West, where earning more than the guaranteed NCAA berth bestowed on the conference tournament champion would border on an astonishing phenomenon. There have been highs under Williams, like the 2002 league tournament title and the school's first NCAA appearance in 12 years, followed by an NIT berth in 2003. There have been lows, like injury-plagued seasons in 2000 and '04. Through it all, UCSB has played to its strength and played a lot of defense. Williams says depth is his one concern about the coming season. He isn't sure UCSB has enough. But if the Gauchos continue to make it hard for others to score -- they have placed second among Big West teams in scoring defense six straight seasons -- there is likely enough offense to improve on a 9-5 league record that left them in a three-way tie for second last year. It helps when you have the league's best player, which 6-foot-6 senior wing Alex Harris is until proven otherwise. He had one of those implausible jumps between his sophomore and junior seasons that you rarely witness, going from a scoring average of 8.3 to a league-best 21.1. Harris had 18 games of 20 points or more and ended the season with six straight, the kind of production that amazed even his coach. "We expected him to have a good year, but not to break out like that," Williams said. "But that's what confidence and maturity does for someone. We just moved him to a wing and turned him loose." Chris Devineis another reason UCSB appears ready to make a serious run at the title. He is a two-time all-conference forward and the team's second leading scorer in each of the past two seasons, combining with Harris for 1,019 of UCSB's 2,065 points last year, making them the top scoring duo in school history. The Gauchos were fortunate to have the NCAA grant Devine a sixth year of eligibility after he missed all of 2003-04 and 2004-05 with knee injuries, meaning he has been reclassified as a junior and will continue putting up numbers for two more seasons. Harris just doesn't think it will take that long for UCSB to stand atop the conference. "We feel like it's our turn to win [the conference] now," he said. "We can't help but feel that way with the team we have coming back. At the same time, it's dangerous to have those thoughts. A lot of things can happen during the course of a long season, which we have seen with some of our past injuries. But we're ready to take it. We're hungry for it. We're tired of being second and third place." But the coach knows it won't be easy to make the jump from second to first. "Much of the last five years have been frustrating," Williams said. "I don't think we have always played up to the level we have been capable of. But if we play at a high level this season, we have a great chance at being successful. This is also one of those years where at least five teams have the ability to play at that level. "A lot of those teams will think this is their time, and rightfully so. This league is going to be very tough. I know how hungry Fullerton is. I know how hungry Cal Poly is. I know how hungry our kids are. I will say this is as good as I have felt about us in a long time." The only thing better might be having Wilson to toss around the island. The Big West welcomed UC Davis in July as its ninth member in the all-California league. The Aggies completed a four-year reclassification period to transition from Division II, having spent the past three seasons playing a full Division I schedule. Davis is located approximately 20 miles west of Sacramento. Six teams last season improved their win totals from the previous season. Cal Poly made the biggest jump from 10 wins to 19, followed by Long Beach State (18 to 24). Big West rosters this coming season feature 25 starters among 63 returning letter winners. Cal Poly returns a league-high 11 letter winners, while UC Irvine, UC Santa Barbara and Big West newcomer UC Davis all bring back eight apiece. Among returning starters, UCI and UCSB lead all teams with four each. Pacific is 100-55 (.645) over the past five seasons, owning the most wins and highest winning percentage of any Big West school in that stretch. Three straight 20-win seasons and NCAA Tournament appearances reflect the program's success over that span. UC Santa Barbara, Cal State Fullerton and UC Irvine all have won 78 games over the five years. Cal State Fullerton welcomes 5-11 guard Josh Akognon, who played two seasons at Washington State and led the Cougars in scoring (10.3 ppg) in 2005-06. He excelled in Pac-10 games. He scored 27 points in an upset of then-No. 10 Washington. He had 25 second-half points in a two-point loss to UCLA. And perhaps his biggest moment came in a three-minute stretch against USC when he scored 16 points to propel the Cougars to another win. Those 11 returning letter winners will certainly help a team that advanced to the conference tournament final last season; the team began 9-9 but then won 10 of its last 12. ... The key loss is all-conference pick Derek Stockalper (14.4 ppg, 7.0 rpg), but senior Dawin Whiten (172 career 3-pointers, fourth all-time in school history) should pick up a bit of the scoring. ... The inside appears in good hands with forwards Titus Shelton and Dreshawn Vance, who both ranked among the league's top five in blocks last season. ... Junior point guard Trae Clark started all 30 games last season. The Titans last year won 20 games for the second time in three seasons and just the fourth time overall, meaning expectations have understandably increased under fifth-year coach Bob Burton (68-51). Disappointment came last season when a 16-4 start was followed by a 4-6 finish. ... The program's all-time leading scorer (Bobby Brown) is gone, but all-conference forward Scott Cutley and his Big West-best 9.5 rebound average returns. The senior also averaged 15.6 points and had a league-high 11 double-doubles. ... Senior guards Marcus Crenshaw and Frank Robinson are also back; each has earned the league's Best Sixth Man award. The Matadors celebrate their 50th season of men's basketball and 18th at the Division I level. Such a milestone will be greeted with the return of the top three scorers from last year, including senior wing Jonathan Heard (13.5 ppg, 1,020 career points). ... Northridge has become a much better rebounding team of late, improving from the league's worst in 2005-06 to second-best with a 38.8 average last season. ... The Matadors are always one of the league's more athletic sides, having proved it by leading the conference in steals each of the past four seasons. All five returning letter winners had at least 22 steals last season and combined for 149 steals. Dan Monson is the former Gonzaga and Minnesota coach who now takes over a 49ers program coming off a 24-8 record and the school's first NCAA Tournament appearance since 1995. But he'll be taking over a completely new team. Gone are the top nine scorers, including four that averaged double figures. ... Of four returning letter winners, only one (senior Artis Gant) played in more than half the games last season. He is also the top returning scorer at a massive 1.9 points per game. ... Junior transfer guard Donovan Morris played two seasons at Fresno State before sitting out last year. 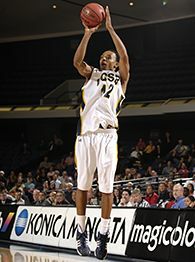 He led the WAC in 3-point shooting (42.5 percent) in 2004-05. It was a new feeling for the Tigers last year, one they hope not to repeat. After reaching the NCAA Tournament and earning 20-win seasons three consecutive years, Pacific finished 12-19 and lost five of its last six. But four of the top seven scorers return, led by junior forward Anthony Brown (14.3 ppg, 7.2 rpg). He improved dramatically at the free-throw line, going from a forgettable 53.8 percent as a freshman to 70.1 percent last season. ... Point guard duties should again be shared by junior Steffan Johnson (16 starts last season) and senior Solomon HorseChief (17 starts). ... One major reason for last year's fall: Pacific ranked last among league teams in rebound average (31.9) and seventh in blocks (1.94 bpg). The good news is that Davis is finally an official conference member and has played a full double round-robin league schedule (16 games) in each of the past three seasons. The bad news is that it went 12-36 during that time. ... There isn't a senior on a roster that includes eight players 6-7 or taller. Junior center Michael Boone stretches to 7-2. ... The Aggies are led by junior guard Vince Oliver, who has started 51 of 55 career games; last season, he averaged 12.7 points and more than 30 minutes. ... Davis was in more games than its 5-23 record might suggest; the Aggies went 3-5 in contests decided by five points or fewer last season. You'd figure the Anteaters will be in the race for a conference title. UCI returns 65 percent of its scoring and 59 percent of its rebounding from a team that won 15 games and led the conference in scoring defense (67 ppg) and blocks (4.1 bpg). Problem is, the Anteaters had a difficult time scoring, averaging just 66.2 points. ... There were no stars last season. Seven players led or shared team-high scoring honors in the 33 games. ... Winning more close games would help this year. UCI played in a league-leading 11 games decided by five points or fewer last season. The Anteaters were 5-6 in those games. ... The top two scorers return: senior forwards Patrick Sanders (11.9 ppg) and Darren Fells (10.2 ppg). Hopefully, Jim Wooldridge knows what he's getting himself into. The veteran has been hired to rebuild the struggling Highlanders program, meaning he is the fourth head coach in the past four seasons. Wooldridge has a career record of 312-237 over 19 seasons at stops like Central Missouri State, Texas State, Louisiana Tech and, most recently, Kansas State. ... Senior guard Larry Cunningham is a career 1,000-point scorer and will be joined on the perimeter by junior Chris Johnson and sophomore Charles Jim-George. ... Injuries led to issues inside last year, when UC Riverside ranked last among conference teams in rebound margin and blocks. The Highlanders also allowed opponents to shoot 53.7 percent inside the 3-point line. Coming off their best conference finish (tie for second place) since winning the title in 2002-03, the Gauchos offer the league's best player in senior wing Alex Harris. He averaged 21.1 points last season to become the first Gaucho since Raymond Tutt in 1997 to win the conference scoring title. ... Others expected to make an impact include junior forward Chris Devine (who ranked in the league's top 10 for scoring, rebounding and field goal percentage last season) and a sophomore backcourt of James Powell and Justin Joyner (each received all-Big West freshman honors). ... The frontline will be improved with the arrival of 6-9 senior center Nedim Pajevic, a transfer from Weber State. It has been a long drought, but UC Santa Barbara should finally be dancing in March. For all the 2007 ShootArounds, click here. Ed Graney is a columnist for the Las Vegas Review-Journal. He can be reached at egraney@reviewjournal.com.